Russellville, WV: Fantastic getaway, hunting cabin or private year round living! 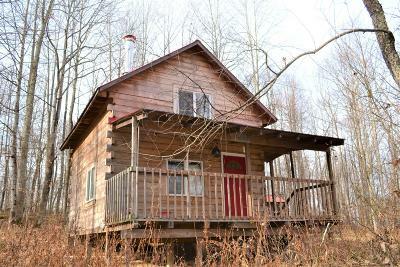 This 1BR cabin with full bath and roomy loft also has a small kitchen like area, living room with cathedral ceiling and beautiful hearth with wood burning stove. The pleasant sound of the rain on a metal roof makes for great sleeping and napping. There's a large front covered porch to enjoy the wooded views, share some thoughts or stories & create some wonderful memories. 54 acres makes for a lot to enjoy. A small pond appearing to be spring feed is just a few enjoyable steps away. Plenty to see & lots of wildlife; deer, bear, etc. Property has some river footage along the Meadow River! You just gotta see this place! Items to Convey: Other: Kubota Diesel Gen.